Planning a group holiday can be a bit of a headache when you’re trying to coordinate 15 – 20 people. Everyone has their own busy schedule to work around and varied comfort levels for accommodations. But there is one way to make it a lot easier for the entire group. Book a luxury Costa Rica beach villa with a chef for the entire group. Vacationing together as a group for a holiday or “just because” is a lot of fun. It makes it a lot more fun when you’re all staying under the same roof. You might go in different directions during the daytime, but breakfast and dinner you’ll all be together again at the villa. You’ll share stories of the fun activities you had and the excursions you can recommend. A luxury villa with a chef makes all of that possible. Renting a luxury villa isn’t as costly as you might think. Depending on your group size and the dates you choose to book, a villa on the beach sleeping up to 23 people can have rates as low as $60 per person. This makes it very affordable for family reunions, destination weddings and even church retreats. 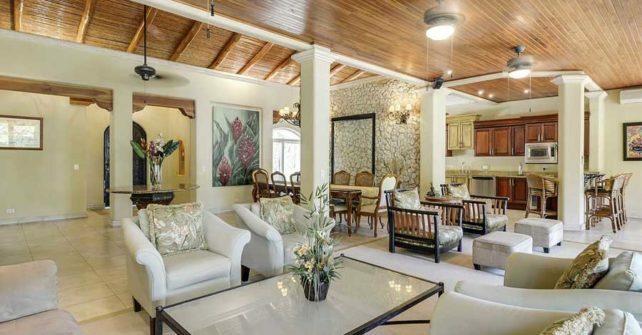 You can see the rates of the very popular Tamarindo area villa named Casa de Luz on their calendar. The villa doesn’t usually come with a chef automatically. A chef with kitchen staff is one of the many villa personnel options that you can book if you need their services. You can book them for one huge dinner party or for your daily meals for your group. How often you want meals cooked for you is entirely up to you and your group. Give Casa de Luz a call today to talk about your group’s accommodation needs for your group holidays. Thank you for giving us a very nice information about Group Holidays in a Costa Rica Villa Rental with a Chef. This blog is very useful to us. thanks for the blog.